Notes: I play this song on Ukulele. I have tabbed it to 5 string banjo in open G. Being a guitar and ukulele player, I have made it easier for us cross over players that can not make it fit into a constant banjo roll. Notes: Here is an original tune I wrote for my middle daughter. I deliberately and systematically worked up the A part, but did not know what to do to finish off the tune. The B part came to me in a dream, believe it or not. I awakened with the melody fresh in my head, and ran to grab a banjo and play it before it faded. Notes: Herb Ellis composition from the 1890's. Notes: This tune is in Cumberland Gap tuning, gEADE. Wrote it for an old friend of mine who has had an interesting life. Enjoy. Notes: This is my arrangement of KH, comprising a low break and a high break. Note that the typical configuration is AABB. Notes: This is my personal arrangement of the tune. Just how I play it. Notes: I'm a beginner and two versions of this song I had weren't to my liking so I downloaded the demo to TablEdit and started working on this. It worked out so well (I think...) that I decided to get the pay copy of TableEdit, do a real nice version and post it here. It's fairly easy and straightforward except you can't really do phantom hammers in TablEdit that I know of so in the few spots where it looks like there is some drop thumb, just play them as phantom hammer-ons instead. Of course, you can probably drop thumb these parts, too, if you like. Notes: The Carter family sings this in Bb. Capo the banjo to the 3rd fret and tune up the 5th string. Or just play it in G.
Notes: This is my original tune. It is a basic breakdown. Learning this song can help you learn and work on skills that are needed for the more difficult breakdowns of Earl Scruggs. 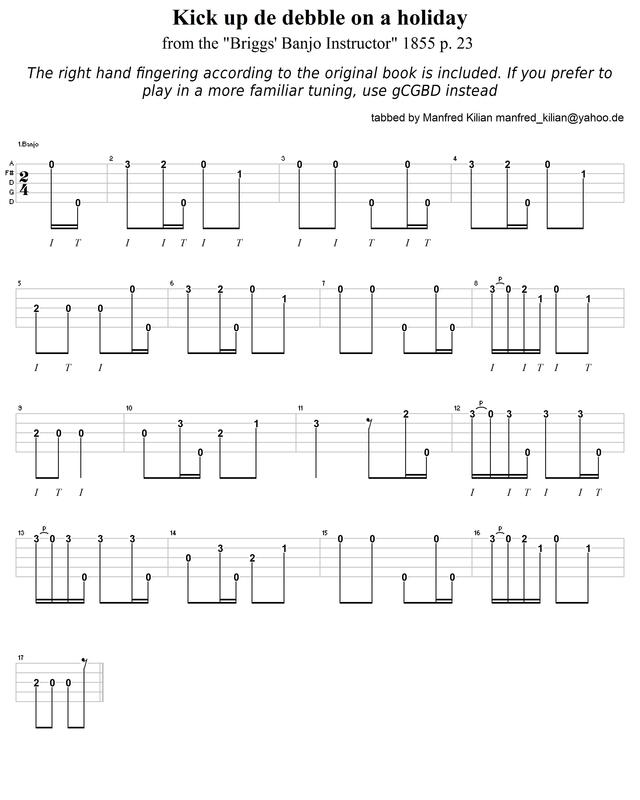 Kenny Baker's "Ducks On the Millpond"
Notes: The tab and midi are in G, but the tune is usually played in A. GuitarPro doesn't seem to understand how to capo a banjo. Notes: This is a STUDY provided to assist in discussion of driving backup on the Playing Advice forum. Transcription is from a slowed version of the song from Rhonda Vincent and the Rage's "Ragin' Live" album. I believe the first 29 measures or so are a reasonably accurate reflection of what Kenny Ingram played during the kick and first verse. I am less confident in the B part (starting at measure 30); there was a lot of artifact in the original recording I was working from and while the banjo in the recording is still providing pulse it's a little hard to hear all the subtleties under the harmony vocals. Notes: Nice little tune with many variations, see if you like this one. Notes: There are two midi sound files posted here: The first midi provides the sound of each string, from 5th to 1st, to help you get your banjo in an Open D tuning. The second midi follows the tab note for note. The midi is played at half speed to facilitate learning. The tab itself is a PDF file for easier access to those who might not have the TABrite program loaded on their computer. Notes: I tabbed this out for a student and found that this song is in high demand for a tab! Notes: Killaloe Boat also known as Ryan's Jig and other titles in Standard Notaion, Tenor tab and 5-string tab (Capo to A (2, 7)) A Dorian. Notes: This is only the A section. Notes: Simple arrangement of this great tune. Play with plenty of drive - think Oberon not Tinkerbell! Notes: This is an old time fiddle number played in A with capo at 2. The second part of the tune has both a high and low variation. They are interchangeable. Notes: I learned this nifty little traditional tune from my Friday night jam buddies. Thanks to Neil, Dennis, and Len. Two things I really like about the tune: First, the melody has some unexpected twists and turns that appeal to me. Second, the A part is in the key of A major, whereas the B part downshifts to A minor. Notes: Guitar Pro File written in ver 6... had to export to ver 5 (GP5) to upload here.